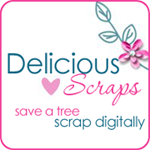 Delicious Scraps: WONDWERFUL LOs by my Creative Team and "Store Closing" SALE!! WONDWERFUL LOs by my Creative Team and "Store Closing" SALE!! I was SOO busy over these few weeks that I had totally forgot to SHOW OFF these GORGEOUS pages by my AMAZING CREATIVE TEAM!!!! You LADIES ROCK as always!!! LOVE LOVE LOVE the pages!!! This BEAUTIFUL LO is by Beverly!! It is made with "Sweet Christmas"
These AWESOME pages are made by Tonisha- Click on the banner to visit her blog!!! Also I am so behind that I have to close my shop at Ahhh Scrap simply because I cannot keep up with it... I am leaving there with great sadness as I loved being there. I also have a sale till January 8th - EVERTHING is 99 cents!! !